Diagnostic ultrasound imaging has greatly improved the services and diagnostic options available to our patients. For example, those soft tissue problems that otherwise cannot be seen on x-rays can often be seen with ultrasound imaging. Tendon problems and the plantar fascia itself can be clearly visualized and evaluated. Often this can be done right during office visit rather than setting up a much more costly MRI. Foreign bodies such as glass and metal objects can be identified and mapped out. Soft tissue growths such as a ganglion cyst show up very clearly with ultrasound imaging. 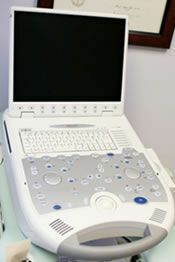 Ultrasound imaging can also be used to facilitate procedures. For example, ultrasound guided injections allow for precise placement of medication. This allows a lower dose of medication to be utilized to help minimize the potential for side effects. For example, heel spur injections and injections for plantar fasciitis with cortisone are much more effective when they are placed directly in the most inflamed portion of the plantar fascia. Another example is ultrasound guided injections for Morton's neuroma. Dehydrated alcohol is utilized for sclerosis of the pathologic nerve tissue. This is done instead of typical neuroma surgery. Dr. Young and Dr. Nelson utilize ultrasound imaging. These may include evaluation of tendonitis or plantar fasciitis. The extent of damage and local edema or deep tissue swelling can be evaluated, often allowing for diagnosis that otherwise might have required an MRI. Other applications include ultrasound guided injections. Utilizing this technique, they can locate the area that needs treatment and make certain that the injection is precisely placed where it is most beneficial. For example, when a patient needs an injection for heel spur or plantar fasciitis, if the injection were inadvertently placed into the fat pad on the bottom the heel, it could damage the fat pad (causing atrophy). Also it would provide much less relief for the inflamed plantar fascia. Therefore, by having precise placement with ultrasound imaging, a lower and safer dose of the cortisone can be utilized and the doctors can be certain that this is placed exactly where it is needed.